C.O.R.E. 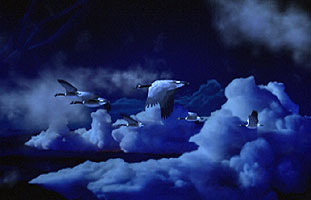 's computer generated geese fly through Dream Quest's sky and cloud elements. 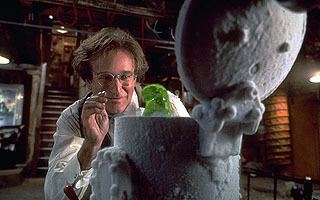 One of the first shots of Flubber, realistically composited through all the steam and mist coming out of the bucket. 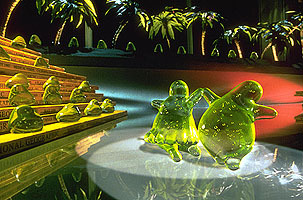 Industrial Light & Magic provided dozens of shots of the ever spirited Flubber, including this mambo scene, an homage to over-the-top musicals. 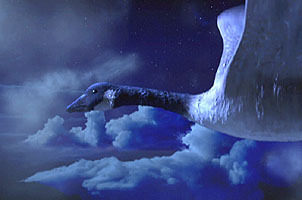 The backgrounds are actually oversized sets shot motion control, and the Flubbers are CG models. 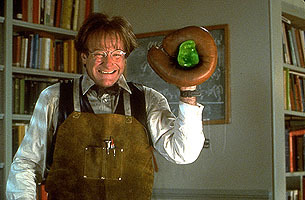 Some Flubber shots were handled by other vendors, including Hammerhead which provided this shot for the film of Flubber resting inside Robin Williams' baseball glove.